My whole life I grew up with a dad who would read war related publications, watch war films on Sunday afternoons in the 1970's [interspersed among the Rugby games and later, the plethoria of war programmes that popped up on the box. He also joined the local 'Razza'  for a weekly ale and he'd bring home stories about the old soldiers he would drink with. WW1 became latent in my blood! Then as I grew up and entered my teen years, I became intensely interested in my ancestors and family stories. This led on much later in life to completing a degree aged 39 and considering a career in archives. Life never pans out how you think it will and so I've ended up in museums instead, currently a War Memorial museum the past 7 years. This is all good though - I love working with the tangible remains of the past and they are always proving themselves relevant in contemporary stories. I'm still tracing my family trees but it often extends to other peoples trees now and I visit cemeteries not just for my own. The family memorials to those who never came home now compliment my photography alongside those ordinary people who I feel will have an interesting story to offer. The memories of all those war films my dad used to watch come to the fore. 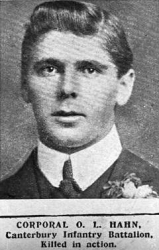 I absorb myself in finding out about those whose names are memorialised on headstones - each becomes quite a personal search whether it be a half hour, half day or a week long effort, the journeys outcome is to get their information online so that something of that long dead soldier may be bought back in to living memory. 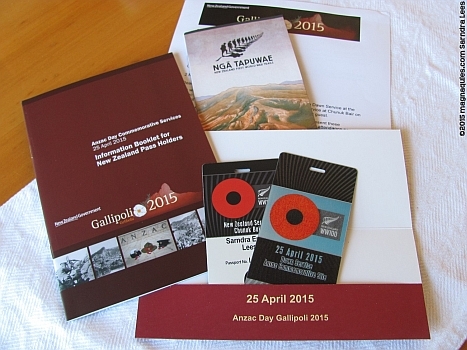 Then the ballot for Gallipoli 2015 makes it's appearance. I put my name forward...why not, it is after all a very special commemoration for 2015 - the 100th anniversary! I do so on 15 November 2013. The wait until the following March is rather excrutiating with all the scenarios running through your head about "what if I get it" and you start planning movements - just to be prepared. Then the blow comes...I was notified on 31 March 2014, no tickets for me in the first ballot. So stoically I get on with life...there is always the second chance ballot! This was an option offered to consider when entering the ballot. If first ballot tickets were forfeited by anyone for any reason then your name would go back 'in to the hat' for another chance. Towards the end of October 2014 the excitement was building up again as the closing date for final acceptance of tickets for the first ballot by those who had won them was coming to an end. I tweeted a comment about this and the tweet was picked up by a PR firm. I was contacted and asked if I'd do an interview on TV1 about what I thought of those who hadn't confirmed their acceptance yet - almost a third of the 2000 tickets, so I did. Most of what I said in relation to why people may not have accepted their tickets and also that people may have been intimidated at organising such a trip was cut out of the interview! I was also to discover that that the lovey cameraman 'Graham' had won tickets in the first ballot! 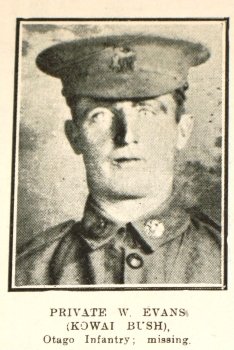 We parted company making mention of waving to each other at Gallipoli...if I got tickets. So November 2014 rolled around and on Armistice day anniversary and the night before I flew to Dunedin to attend a War Memorialisation & the Nation conference in Dunedin, I was advised I was successful in the second ballot! Much excitement, disbelief and utter thankfulness that i'm one of the extremely lucky few given the chance to attend the 100th Commemorations at Anzac Cove. I felt indeed and still do, in a position of privilege. So! Much organising has happened. We had 3 1/2 weeks to organise flights - we did this within 5 days. Luckily the tourist firm that caters especially for Kiwi's and Aussies, 'Crowded House Tours' in Turkey had been recommended to me by our director at the Museum, Roy Clare and also by military historian Chris Pugsley whom also attended the conference in Dunedin, and so it was a foregone conclusion and most certainly a correct one, as Crowded house have been fantastic to work in with. We now have a 2 week jam packed itinerary in Turkey being run around everywhere and doing the whole touristy thing. Lots of pre arranged tours including hot air ballooning and involves 3 internal flights in Turkey. On 1 May we fly to the UK for four further weeks to visit family and soak up some museums, interesting places and I especially want to visit Richard III's new grave in Leicester. We will be completing a round trip from London, across to Wales and having the last 3 days at Berkhamstead. We fly to Istanbul on 17th April and arrive back in New Zealand on Queens Birthday weekend. The preparation AKA retail therapy has been lots of fun. The one momentous night at Anzac Cove requires gear I didn't have - wet weather, thermals, a minimal seat pad to sit on - no camping chairs or equipment is allowed; new walking boots etc and we've bought awesome new back packs as we can only take small day pack with us to carry everything when at Gallipoli - we have SUPERB Kathmandu litehaul 38L style and they double as carry on bags for the plane. I've even bought a second canon camera - no way am I going to have my other camera fizzle out in the middle of proceedings! We're also armed with charge packs and heaps of batteries. 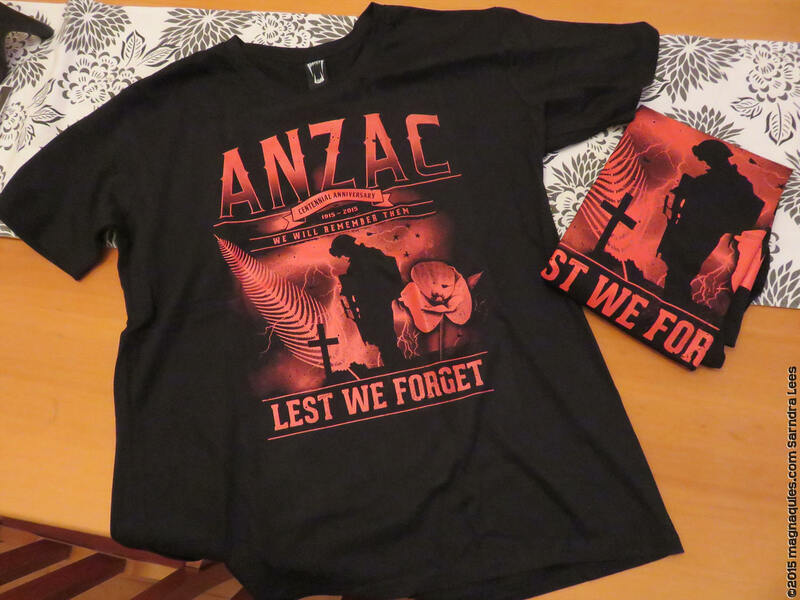 Yes i'll be an emotional wreck, I always am on Anzac Day anyway. I will be taking small vials with me, catching my tears and sealing them. Mementoes of the occasion to pop in with my family treasures. I may not have a great grandad that served in WW1 but I had a lot of 'cousins', they deserve to be remembered as do all those soldiers who died...and those that returned - no matter what battle. 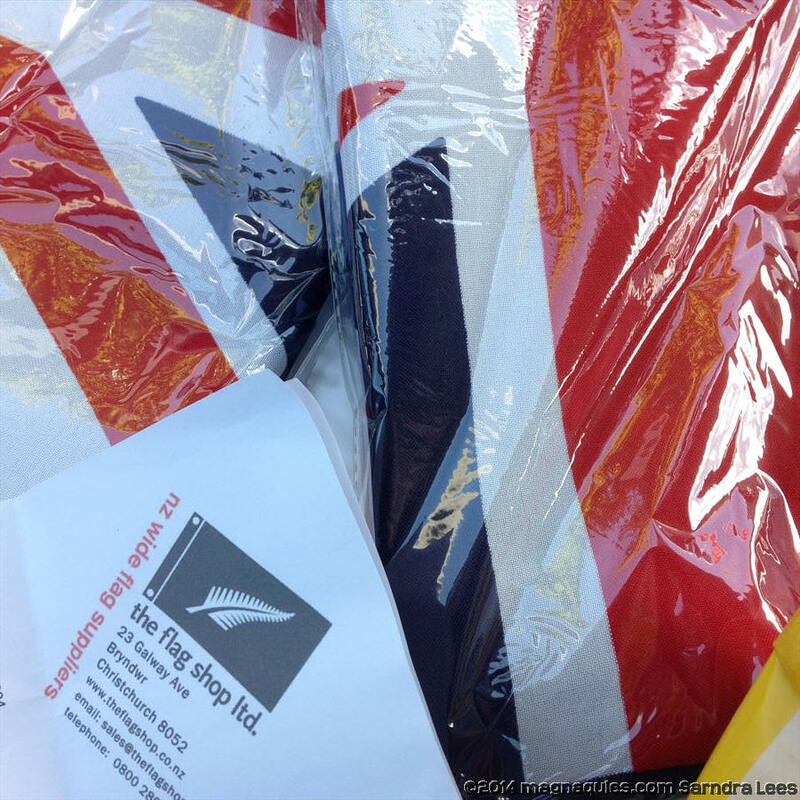 We're prepared - we have our New Zealand flags to wrap around us! 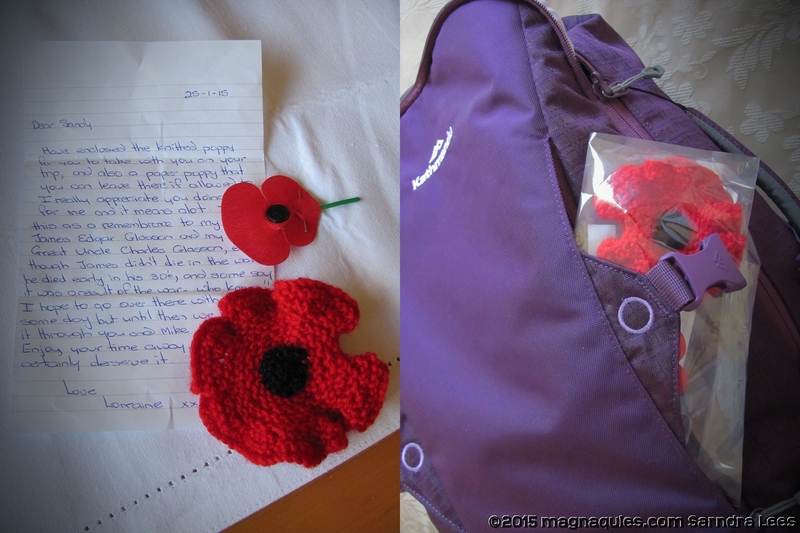 And a very special poppy waits in my back pack to be taken to Gallipoli, for a friend. As an aside, here is a 2 hour long programme broken in to 2 one hour long videos. It is excellent. 'Razza' - The RSA - Returned Services Association, and he did religiously till the branch he drank at fell down in the Christchurch earthquakes of 2011. Then they commandered a bowling club and continued the ritual!